Political Dirty Tricks behind Press Tour? It seems clear to me, given the pervasive illiteracy about both race and gender or the ways these intersect in our society, that the recent press tour by Rev. Wright is a disaster for the Obama campaign. While I certainly agree with Joe’s point about the data supporting much of what the Rev. says, the fact is, mainstream [read: predominantly white] audiences in the U.S. are simply not equipped with the vocabulary to be able to discuss these issues in any way that captures the nuances. Multiply that by the reverberation-chamber and dumbing-down effects of the 24-hour news cycle, and I am less optimistic than ever about Sen. Obama’s prospects for getting the nomination. And, now this. A former editorial board member at USA Today, she runs something called Reynolds News Services and teaches ministry at the Howard University School of Divinity. (She is an ordained minister). It also turns out that Reynolds – introduced Monday as a member of the National Press Club “who organized” the event – is an enthusiastic Hillary Clinton supporter. Louis also includes some bits in his story about Reynolds’ trashing Obama’s “audacity of hope” theme. Fair enough to criticize, but why orchestrate this event which is going to have the obvious result of throwing Obama under the proverbial bus? If we were able to have a more nuanced discussion of racial and gender politics in this country, we might be able to talk about what it means that a black woman played a role in this and why black women (except for Michelle Obama) have been noticeably absent from the ‘race versus gender’ trope for talking about this election. And, if were able to have a more nuanced discussion, we might talk about how Clinton is responsible, as a white woman, for a nasty little set of identity politics. Yet, we won’t be having those conversations. Instead, we’ll be listening to pundit after pundit talk about the personal jealousy between the “kooky” (how else to make sense of Black Liberation Theology?) Rev. Wright and the “political dirty tricks” of Rev. Reynolds. Thus, leaving the collective debate stalled at the inadequately personal level and obfuscating real understanding than race or gender meme, rather than talking and thinking about the ways that race and gender intersect at the same time, in the same individuals within a broader social context of inequality. Since Obama could never win any way, because of the high level of white racist thinking about black men (polls show him at only 37 percent of white voters vs. McCain, I tend to think that the heroic Dr. Wright speaking out is a good thing, esp. since he is one of our outstanding thinkers on the morality of race and racism. The main impact of the brave and pioneering Obama campaign and of the courageous Dr. Wright speaking out against vicious personal and racist attacks on him, a military hero, (I doubt that any of us could have held back as long as he did?) will be to once again raise issues of how racism works in this country. He is way ahead of his time, and data are overwhelming on this. And can we trust the right-wing daily news to put out an honest story on all this? Sara at blog for our future has an interesting take on this as well, along the lines of joe’s. Oh come on now, he can still win…yan here to balance the yin on this issue with Obama and his chances of becoming our next President. Being short, there are many things disturbing but perhaps most of all is how the media and politics has damaged a very special relationship between Obama and Wright. In the current time, I am finding it very disturbing that Obama is attempting to distance himself even further from Wright. I thought he handled the first round okay…but am extremely uncomfortable with what seems to be further distancing and denouncing (to appeal to white voters? Naaaw. Not good). In terms of numbers, surveys, etc. I pretty much ignore them–not to say they aren’t useful. But they have been wrong and misleading too many times throughout this campaign…. I am still optimistic and he is now back up to the same lead (or higher) in terms of delegates before the PA primaries. 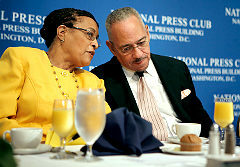 And for those who argue race is not an issue for Obama, no other white candidate (male or female) would ever have their relationship with their minister damaged for reasons that both apply to, and tie back to addressing the reality of the systemic and ongoing contemporary racism and other inequalities in this nation. Is it possible to be patriotic in this nation and be non-racist? Is it possible to be patriotic and critical on your own nation? Questions could continue, but it is so complicated….and the media, society would do itself a favor it they limited their exposure to it as far as I”m concerned. Most of those on the television are not qualified to be discussing these matters critically to the masses…But nonetheless, the media will do what it can for ratings and for all I know, the superdelegates have not cast their votes because the media is so busy profiting off of the ongoing newstories and coverages with this campaign (other stories may not hold people as strongly, regularly, etc., bringing ratings down, and so on…). But I agree with Jessie’s suggestions about the media above very much.